When you're in the mood for a pumpkin whiskey drink, the pumpkin old-fashioned is sure to please. It's surprisingly simple, requires no muddling, and mixes up in minutes. Plus, unlike other pumpkin cocktails, there are no strange or hard-to-find ingredients that you need to hunt down. This fascinating twist on the classic bourbon old-fashioned was created at The Boxer Hotel's Finch Restaurant in Boston. It is a simple recipe of bourbon and Grand Marnier with pumpkin puree and maple syrup. When making it at home, you can easily find pumpkin puree at any grocery store, or ​try making your own puree just like they do at Finch. It is very easy and the fresh puree makes this drink really special and tasty. Combine the bourbon, Grand Marnier, pumpkin puree, maple syrup, and bitters in a cocktail shaker filled with ice. Shake well and double strain through a fine mesh strainer into a chilled old-fashioned glass filled with fresh ice. 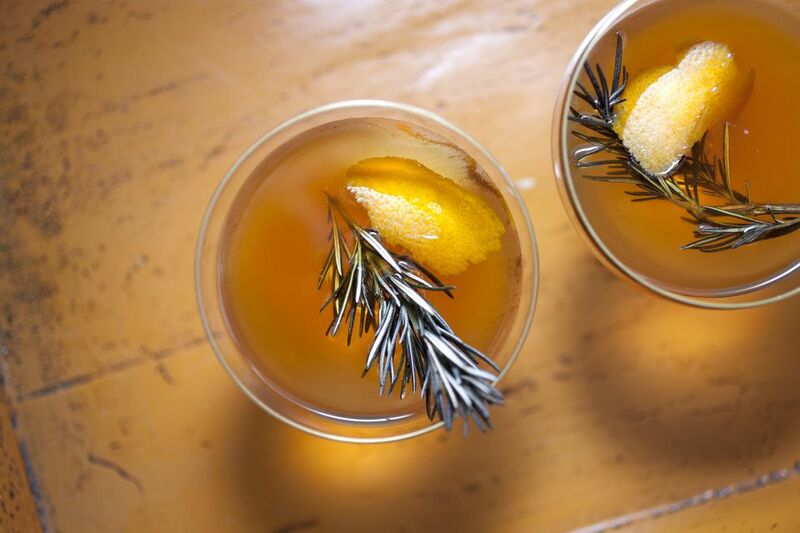 Garnish with a rosemary sprig or orange peel. Give this drink a really good shake for at least 30 seconds to thoroughly mix the ingredients. The maple syrup and pumpkin puree are not as easily mixed as typical cocktail ingredients, so putting a little more effort into it will help. To ensure a clean drink, it is wise to fine strain this drink. Simply use your normal cocktail strainer and pour through a fine-mesh strainer that's placed over the glass. This should catch any extra pumpkin chunks. For the bourbon, choose a top-shelf whiskey, just like you would for any old-fashioned recipe. This one would actually be best with a really bold bourbon because it will not get lost against the pumpkin. Look for anything that's bottled higher than 80-proof, such as Bulleit or Knob Creek. Pumpkin puree is a great way to transform the flesh into a useful ingredient for food, as well as drinks. There are a couple of simple ways to make it. The quickest method bakes pieces of pumpkin in a 350 F oven for 45 to 60 minutes. You can also make pumpkin puree in a slow cooker, cooking the pieces on low for about 5 hours. With either, use a food processor or electric mixer to beat the soft pumpkin into a smooth puree. Try this recipe with your favorite rye whiskey rather than bourbon. The whiskey's signature spice is a great complement to pumpkin. If you'd like an alternative to maple syrup, mix up a batch of spiced brown sugar syrup. It includes allspice, cinnamon, cloves, and nutmeg and will give the cocktail a pumpkin pie-like accent. How Strong Is a Pumpkin Old-Fashioned? Any variation on the old-fashioned cocktail is going to be relatively strong because the drink is designed to feature bourbon in a slightly dressed up form. This one is no exception. When made with a 100-proof whiskey, for instance, its alcohol content should be around 21 percent ABV (42 proof). Will You Take Honey or Ginger in Your Gold Rush Cocktail? Will You Take Your Derby Cocktail With Whiskey or Gin?